Stolen was a Gibson Southern Jumbo (serial number 2424030) and a Gibson Hummingbird, plus his pedal train pedal board with various pedals as well as a microphones, cables, harmonicas, etc. Please keep an eye out. Check your local pawnshops, etc. If you have any information, please email Jessica at jessica AT stephenkellogg.com. Jessica is also on Twitter. One of the guitars is pictured here. Let’s get this information out there and help Stephen find his gear. 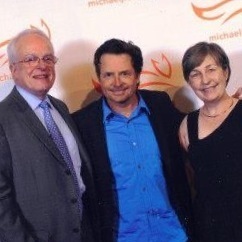 My parents with Michael J. Fox at the Team Fox MVP event in New York City this April. I can’t make it down from Connecticut for this but, if you live in the Baltimore area, I hope you’ll check out this event on Friday, May 24 at Pratt Street Ale House downtown and enjoy some food and drinks for a cause that’s very important to me and my family. After being diagnosed with Parkinson’s in 2011, my mom’s been working hard to raise money for The Michael J. Fox Foundation, an organization “dedicated to finding a cure for Parkinson’s disease through an aggressively funded research agenda and to ensuring the development of improved therapies for those living with Parkinson’s today.” Those are my parents, pictured on the right with Michael J. Fox, at an event in New York City last month that they were invited to because of my mom’s fundraising work. I’m so proud of her and what she and others are doing through Team Fox to help find a cure for a disease that affects her and millions of other people worldwide. On Friday, May 24 CharityBeers is holding an event at Pratt Street Alehouse in downtown Baltimore, just a few blocks from Camden Yards and the Inner Harbor, with a portion of the proceeds going to the Michael J. Fox Foundation. According to charitybeers.com, “the party will kick off around 8 p.m.” and will feature “$4 select Oliver Ales and $5 select apps” along with “other drink specials.” The Orioles are out of town — stop by have some food and drinks for a great cause and I’m sure they’ll have the game on at the bar too. A bunch of my family will be there along with my mom. I hope you can join them. Friday, May 24, 2012 from 8 p.m. to 11 p.m.